In a historical reimagining, must the whole world be drastically different than history? Or can the plot hinge on one detail from the past that only changes history by allowing the main character to be changed as opposed to all of society being changed? And if the change is not drastically different for society at large, would it simply be labeled historical fiction? Emily May of Goodreads did a recent beta-read critique for my YA UF and said she ‘really enjoyed the story’ and that she ‘hasn’t read anything quite like it’. Although that was great to hear, I am struggling to find relevant comp titles for my query. Do you have any tips on the best way to approach this? Hi Suzie! What would you say is a good way to make your query stand out? Thank you! What’s the best way to personalize a query for an agent? Do you prefer this at the beginning or the end of a query? My question is about less quoted genres in queries. In my MG novel the supernatural events are neither accepted and reasonable (fantasy), nor accepted as entirely normal in a realistic setting (magical realism), which puts my novel somewhere in between Fantasy and Magical Realism, or, in fact, precisely within the boundaries of the genre of the Fantastique. The question ‘What is Real?” is central to the theme of the novel too, so the genre and the theme are very connected. I am at loss now how to refer to my genre in the query, the fantastique, low fantasy, or contemporary with elements of magical realism. How do you recommend writers ask newer agents about previous deals on the call? Especially if that agent isn’t listed in Publisher’s Marketplace or doesn’t have any deals listed there? If I’m querying a YA fantasy and my only published work to date is a nonfiction science PB (traditional publisher), should I mention that in my query bio or leave it out? If there’s a unique twist to a novel that’s a big reveal, should the twist be included in the query to an agent or only included in the synopsis? Thanks so much! I tend to write college age YA/NA but how do you recommend writing queries for NA that has crossover potential to be YA? Is it necessary to mention in a query if my story is told via ‘found documents’ (incident reports, voicemails, text chat, audio transcripts etc)? Thanks! How does the process of querying change when you write with a co-author? Hello! How long should one generally wait to nudge an agent on a full/partial, if the agency website doesn’t have any guidelines? Is there any sort of a one-size-fits-all rule here? Or does it depend on the agent/agency? When writing a query, how do you gauge how much of the worldbuilding to include? I know the main character should be the focus of the query and typically the character details should start the query, but I’m having a really hard time not setting up a bit of my world first because it directly effects the character’s conflict. Especially because of the novel is a high/epic fantasy. Thanks so much!! What stands out in a query for you? As a Muslim WOC, do I have to share all of the marginalizations of my main characters in my WIP to label it as #ownvoices? I share 2 out of 3. How much “voice” should you show in a query? Is it better to be straight – forward in your descript rather than risk coming across as “gimmicky”? There was some back and forth yesterday online about whether authors should have their work edited at all before querying. I was wondering what you think and what level the work should be at when it gets into your hands? Thanks! I recently did another overhaul of my one of my complete manuscripts with a sensitivity reader after receiving some critique from a few partial requests and she advised me to make mention of my teaching connection at an international school since my protag is a second generation immigrant and I am not telling her story from that distinct perspective or with that direct tie in to the story, but I wanted to give the manuscript more authentic voice and value from the perspective of someone who is of this group and I wonder if it would be wise to mention that in the query? What is the most important part of a query? What are the biggest things that make you say no to a query, aside from “not just connecting” with it? How do you prefer your queries to be formatted? Do you like to see comp titles in queries? Hi Suzie, how do you know if your idea is the right book idea to query? Every time I read over my query it sounds a bit generic or overdone, but when I reread my novel, I keep thinking that it’s the perfect story to query. Any suggestions on how to get rid of, or fix, this doubt? What do you feel is an acceptable length for a MG fantasy? Do you always read the entire query? If you request pages, do you go back and re-read the query or initial pages you received or do you start where you left off? I noticed that your agency’s policy is to not query more than one agent. Does that mean query one person at a time, or that a no from one is a no from all? How often do you share a query with a colleague when you see potential but it’s not a match for you? Thank you! Hi there! Thanks for covering this session. Can you talk a little about how you and your agent/editor decided this was upper MG and not young YA? Does the age of the person querying matter to the agent? If the writer were a minor, does that have any influence over your decision? Thanks for sharing, Alyssa! I’m curious, how do you infuse excitement and wonder into contemporary fiction without the flash of fantasy? What are some of the biggest differences and similarities of world building between MG and YA? When should you query your work? Other than NUMBER THE STARS and WHERE THE WATERMELLONS GROW, what books do you recommend that are older MG that tackle serious issues successfully? How do you approach choosing a title? THE INVISIBLE BOY is also the title of a picture book, did this come up at all with your editor? What made everyone decide to stick with the title? Hi there, how do you know when your book idea is the right one to use? I have a book draft that I love it every time I read it, but every time I write a synopsis of query, it seems very generic or overdone. I’m not sure whether I should go through with it. (My apologies if this is posted twice, I’m have some tech errors on my end). What about Middle grade has made you want to write it above other age groups? Thank you for jumping in at the last minute! Very informative. Where does time travel fit on the YA continuum as to what’s selling or not selling these days? Would I be better off pitching the book as adult–the narrator is 17, but I’ve been told the voice is too adult for YA. 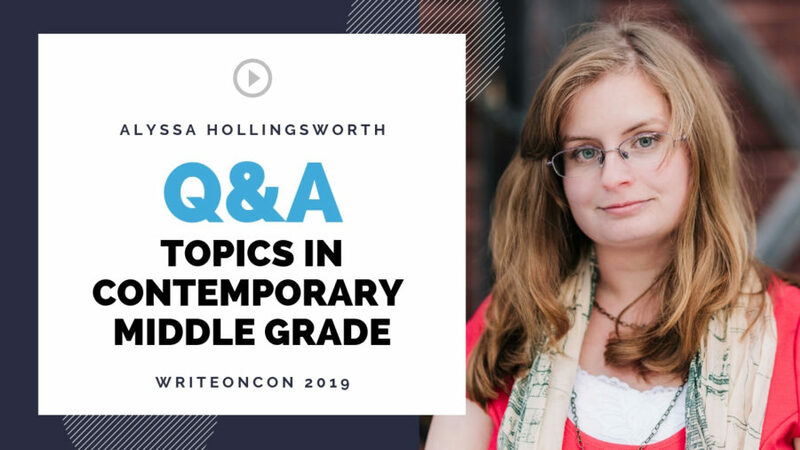 Thank you for your thoughts on writing middle grade! Really made me think about my own projects and my decisions.